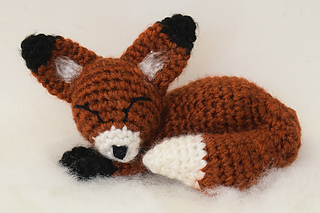 This pattern is for Fia, the Fox in the Snow. 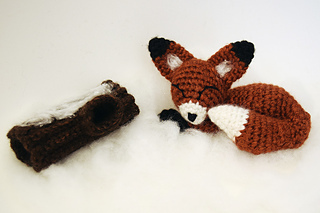 Fia is a curious little critter who loves playing in the snow with all her forest friends. On cold winter nights, she cozies up and keeps herself warm with her big bushy tail while fairies and elves whisk her away into peaceful dreams of magical things. 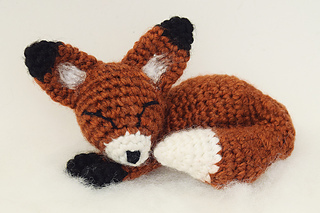 Fia’s body and tail are crocheted seamlessly, while her head, ears, and front legs must be sewn on using the amigurumi seamless join technique. She works up very quickly because of her small size. 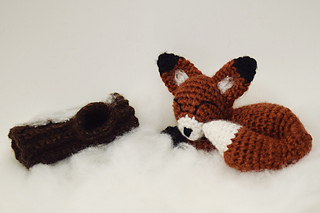 Size: With worsted weight yarn and a 2.25 mm crochet hook, Fia is roughly 3 inches in length, and 2 inches in height and width. She will sit comfortably in the palm of your hand. The pattern is in PDF format. The document is 12 pages in length, and includes detailed instructions and numerous photo tutorials to guide you through the process of creating Fia, the snowy hollow log, and of course, snowflakes! The PDF file will be available to download as soon as you submit your payment (instant download). 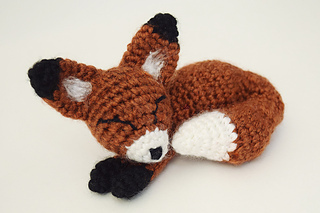 Also, if you have any questions while crocheting Fia, feel free to contact me.